There are several tests that have to be performed in a crimped wire connection in order to confirm its quality and durability and in order to ensure a long service life. These tests include compliance with engineering requirements, maintenance and calibration of the crimp tools, visual inspection of the crimp connection, etc. Common tests performed in crimp connections are crimp height and crimp pressure measurements. These measurements may be enough to indicate a condition that requires further attention, but the ultimate test which can give the final answer to a crimped connection being accepted or not, is the tensile strength (pull force) test! If we want to correctly calibrate our crimp tool, besides the dimensional calibration and the go / no-go gauges, the best way is to perform a tensile strength test to a number of samples of crimped joints produced by our crimp tool. The number of samples to be tested, as well as the frequency of the tests, depends on the customer’s requirements, the manufacturer’s specifications, the usage of the crimp tools and the requested compliance to specific standards or specifications. A tensile strength or pull test actually means to hold a crimped connection steadily and apply a force to it. There are two methods to maintain a continuous force on a test sample. One way is to attach one end of the sample to a stationary point and the other end to a certified and calibrated weight of a precise required value. The other way is to use a pull tester, which is a machine especially designed for this purpose. The more preferable of these two methods is the pull tester method. 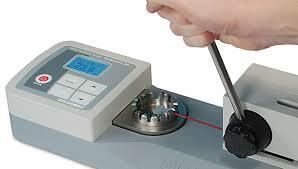 Keeping in mind that each standard weight needs traceable calibration; that each gripper, hook and any other accessory add weight that might invalidate the calibration and in the case when a wire breaks, the weight will fall and might be damaged or, even worst, cause an injury, the weights method becomes not really practical. There are several types of pull testers. There are simple manual testers which are suitable for in-house testing and require special handling by the operator in order to produce reliable results. On the other hand, there are motorized pull testers which are more reliable and have many more capabilities than the manual ones. Motorized testers have controlled speed and they usually have a stop feature, in order to avoid overstressing of the load cell. There are also small portable pull testers which are battery operated and they have limited capabilities, but are useful for on site tests. One of the most important considerations when performing a tensile test is to hold the crimped terminal in a stable and straight position, without applying pressure to the crimp area. In order to accomplish this, most of the pull testers use a slotted terminal as a gripper. This is actually a slotted wheel with various slot sizes. The operator has only to find the appropriate slot which is larger than the cable diameter but not larger than the contact or terminal. As mentioned above, there are two ways to run a pull test on a crimped connection. IEC 60352-2 “Solderless connections – Part 2: Crimped connections – General requirements, test methods and practical guidance” describe the non-destructive test method. UL 486A “Wire connectors and soldering lugs for use with copper conductors” requires that the minimum pull out force must be maintained for 1 minute. In other standards, which have more strict requirements (such as military standards) and which require a destructive pull out test, the pull tester used for the crimped joint test shall be motorized in order to have the capability of moving at a rate of 1″ (25.4mm) per minute. When performing a destructive pull out test, the type of the crimp separation must be also included in the results. There are several types of separations. The conductor might break at the crimp, or outside the crimp. It might also be totally pulled out. The tensile strength (pull out) test is an important test for crimped connections. It is far more reliable than simple dimensional tests. Pull out tests must be performed by laboratories which have the appropriate procedures and the suitable equipment such as pull out testers. 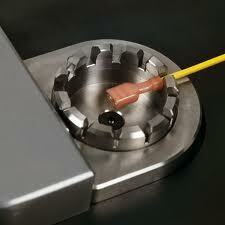 And of course, we should not forget that pull out testers are instruments used for measurements. This means that a pull out tester must be calibrated in the appropriate calibration intervals, in order to be able to provide accurate test results. Do Crimp Tools Need Calibration?